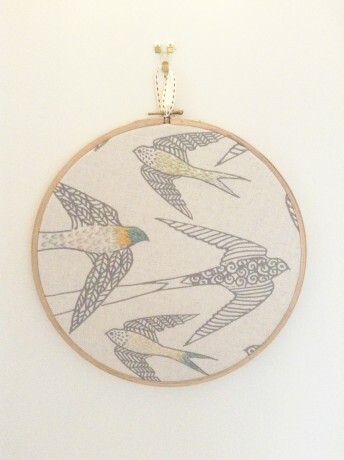 The embroidery hoop art features swallow fabric which has been originated by Ena, a creative fabric designer who lives in Cape Town South Africa. Ena is inspired by the beautiful countryside around her. In soft shades of grey on cream the instantly recognisable swallow motifs are beautifully appliqued enhancing the fabric with colour and texture. The fabric hoop is a beautiful boho decor to enhance the walls in an hallway or in the dining room. The fabric fits securely within the embroidery hoop, and has an attractive ribbon loop to hang the artwork on the wall.Available in the UK exclusively from AuraDecor Designs.